In an op-ed penned for Breitbart, Sen. Rand Paul (R-KY) explained that President Donald Trump's upcoming executive order--which would legalize the sale of health insurance across state lines--would come at zero cost for the taxpayer and would enable 28 million people "left behind" by Obamacare to purchase insurance cheaply. According to Paul, the executive order will create "Health Associations," which would allow people to create groups similar to large corporations in order to get lower premiums on their plans. 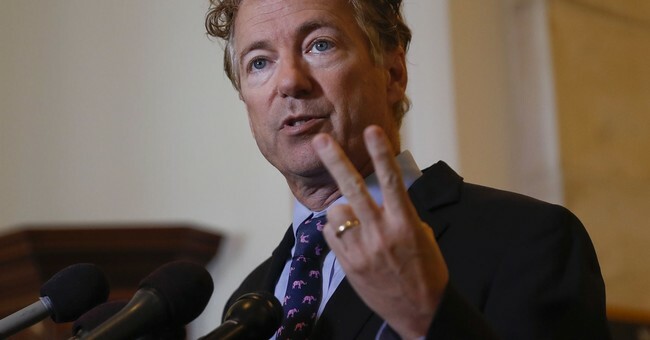 Paul said that these Association Health Plans will "be among the biggest-free market reforms" of the healthcare industry in decades, and is a better alternative than repealing the bill outright. Paul called Trump "bold" in making these changes, and said that he worked with Trump for a long time to create this executive order. Additionally, Paul explains that these new "Health Associations" are cross-state entities that are exempt from some of the costly state and federal regulations other plans face. Pre-existing conditions are not a disqualifier from the plan, either. Paul supports this plan as it is not a mandate, subsidy, or tax, but rather is a removal of regulations and other barriers. Trump is scheduled to make his announcement regarding the executive order shortly.